A section of beachfront in Point Pleasant Beach, N.J. that will soon undergo a beach replenishment and dune construction project. Owners of two houses in Point Pleasant Beach were recently awarded more than $590,000 in compensation for the loss of some of their sand and ocean views to make way for the project. POINT PLEASANT BEACH, N.J. — After Hurricane Sandy pummeled the New Jersey coast in 2012, then-Gov. Chris Christie set out to build protective sand dunes along most of the state’s 127-mile shoreline. Despite lawsuits from homeowners throughout the Shore seeking to block the project, the state prevailed and much of the work has been done. But two recent jury awards in cases seeking compensation for beachfront property owners for the loss of part of their sand — and oceanfront views — have environmentalists worried that a wave of similar payouts could make it too costly for the state and federal governments to finish and maintain the dunes. Damage from Sandy was demonstrably less in areas that had sand dunes than in areas without them. In recent months, the owners of two homes in Point Pleasant Beach were awarded over $590,000 by juries. The most recent verdict came Thursday, when a couple was awarded $330,000 for the loss of beachfront property and oceanfront views. “It’s extremely alarming,” said Jeff Tittel, director of the New Jersey Sierra Club, which along with most of the state’s environmental groups has strongly supported the dune project. "We as taxpayers are paying millions of dollars to restore beaches and build dunes to protect lives and property, and now we have to pay them for the privilege. "I almost feel like we should take the sand away and let them get wiped out by the next nor'easter," he said. "If those dunes weren't there and these houses were destroyed, they'd be the first ones running to FEMA for a bailout." Tittel said he worries that the state and federal governments could be forced out of the dune business by a flood of similar jury awards; there are numerous similar cases pending in the courts. Ralph Coscia, founder of Citizens Right to Access Beaches, also fears that a slew of homeowners may file similar cases. "It could stop these dune projects in their tracks, even though we know that the dunes have done so much to mitigate storm damage," he said. A spokesman for the state Attorney General’s Office would not say Friday whether New Jersey planned to appeal the recent jury awards. On Thursday, a jury in Ocean County gave $330,000 to Dennis and Catherine LaPlante, who lost about 60 percent of their oceanfront lot to the dune project, according to their lawyer, John Buonocore Jr.
“They had an area that was in effect their yard, and now they don’t,” he said. A similar case was decided last fall when the owner of another home in Point Pleasant Beach was awarded $260,260 for the loss of part of his property and its now-decreased value. They were the first jury awards in dune compensation cases since a 2013 state Supreme Court ruling requiring that the protective benefits of a sand dune on a property’s value be considered against the decreased value from loss of land and ocean views. 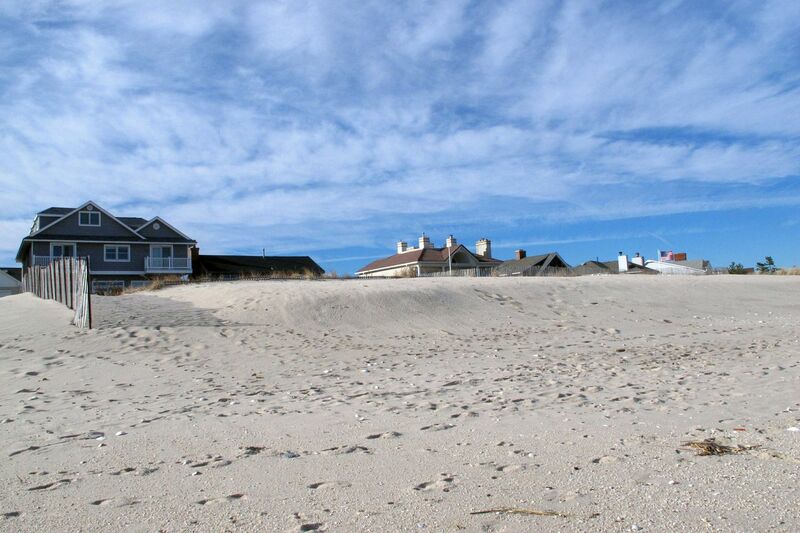 The high court ruling involved homeowners in Harvey Cedars on Long Beach Island. The couple were awarded $375,000 for the decreased value of their property and lost ocean views caused by dunes that were built before Sandy. Ironically, those dunes are what protected the couple's house during Sandy while other areas without dunes sustained major damage. After the New Jersey Supreme Court ruling vacated the award, the couple accepted a $1 settlement from the state. The attorney who represented them in the Harvey Cedars case, Peter Wegener, is also the attorney for the owner of the other house in Point Pleasant Beach who received $260,260.